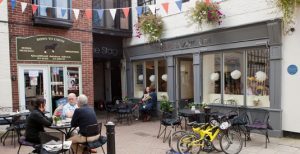 With its welcoming atmosphere, Southwell is a charming environment where people come together for shopping, leisure, entertainment and to meet with friends. Southwell’s independent-based high street, nestled in our picturesque streets and alleys, is one of the jewels in our crown and makes Southwell a favourite destination for tourism and shopping. In 2017, the Sunday Times lauded Southwell for “its own personality, with its established independent shops and restaurants”. Our town has everything you need for a unique shopping experience away from busy city centres and identikit shopping malls. Our many independent shops offer a huge choice of designer ladies’ fashions, top menswear brands and children’s clothing, contemporary and classic interior design and home furnishings as well as electrical goods, hardware, DIY, sweets, and sportswear. offering everything from tea and cake, soup, salad and curry to tapas, pizza, fine wine, and real ales. If a little pampering is what you’re after, the town boasts several hair and beauty salons, along with complementary and holistic therapists. With easy and inexpensive parking, along with its many cultural attractions, including the stunning Southwell Minster, Southwell has everything you need to enjoy a day out or a longer stay. If you would like your business to be listed in our Directory, please click here to download a request form and send it, when completed, to [email protected]. Details can be typed into the form or be entered by hand. We don’t publish individuals’ names, except when their name forms part of a contact email address. If there are any errors in the information already listed or if you would like to update the published information, please let us know at [email protected].